Take a look at these homemade 4 foot by 8 foot election signs. More on the homemade from materials had on hand later. .
Now, these signs along with the many smaller 12 inch by 18 inch and a few 18inch by 30 inch signs which will also be shown here ARE PROFESSIONALLY MADE. None of these signs are homemade in the slightest. What is the importance of something that seems so innocent? 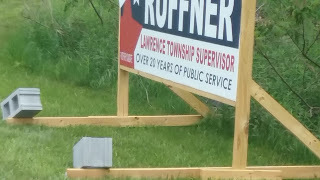 First of all a candidate running for public office, in this case the position of Lawrence Township Supervisor, should not be deceptive in his campaign costs and needs to fully disclose the costs associated with such campaign advertising. This is required under Commonwealth of Pennsylvania Campaign Finance Election Law. Within this law it states a candidate must file a Finance Campaign Report when expenses within certain timeframes before and after an election exceed $250.00. Now this is where Mr. Ruffner's 8 foot by 4 foot "homemade signs" 4 of them in total come into question. First these signs were placed within the last 15 days preceding the May 2017 Primary election' which according to the PA Campaign Finance Reporting Law requires daily reporting. 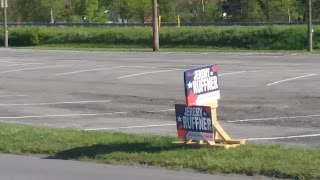 Now maybe Mr. Ruffner did not spend more than $250.00 on these 4 large signs and additional smaller signs he placed within the final days before an election. 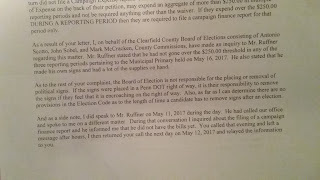 Several inquiries to the Clearfield County Board of Elections dating from mid March to May 2017 covering several reporting periods have yielded nothing but the typical Clearfield County run around - well Mr. Ruffner has until this date to file, etc. It is right of any citizen to request a candidate's campaign finance report as such a report is public record, pending the fact they are honest and truthfully disclose not only the cost but the source of their financing, . Since the candidate cannot disclose the cost of these signs several estimates were obtained from local sign makers. Estimated cost for these signs came in at $200 to $300 for the sign part itself. As none of the sign makers made the pressure treated wood frame a price for materials was obtained from Lowes for these materials at $147.00 plus or minus a few cents for all 4 signs. 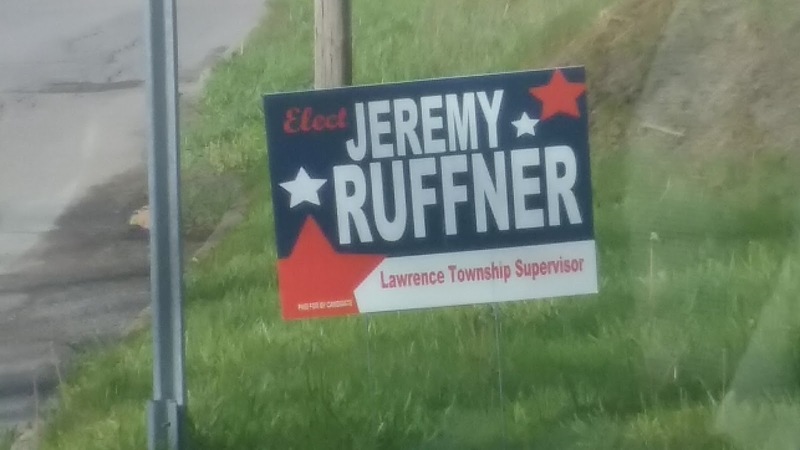 This makes the estimated cost of Mr. Ruffner's 4x8 foot signs approx. $236.75 to $336.75 each for a total of $836.75 to $1,236.75 for the 4 signs alone. Now add in the additional smaller 12 inch by 18 inch signs with a an estimated price of $10 to $16 apiece and its not to hard to imagine this candidate exceeding the $250.00 threshold. Take note also that each sign has the required paid for by candidate disclaimer. This is very important as this means paid for by candidate, and not the candidates business, family members, friends, or by other means. Ok now we get to the homemade sign bit. 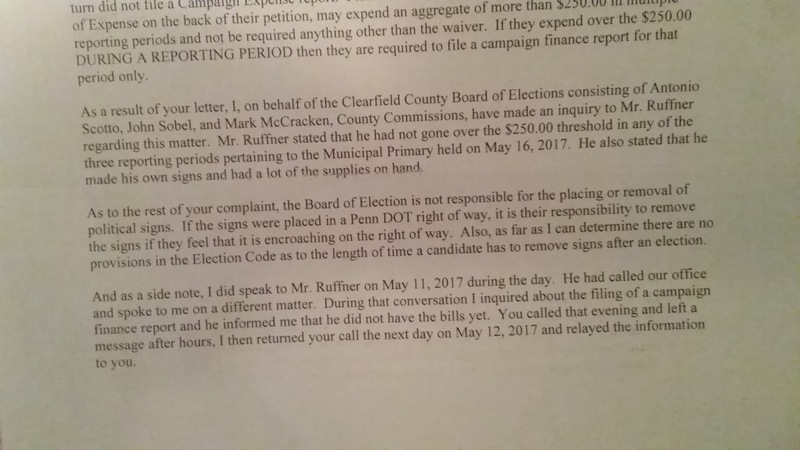 First you can listen to response from Clearfield County Election office on first request for finance report after Mr. Ruffner places large signs beginning of May 2017. 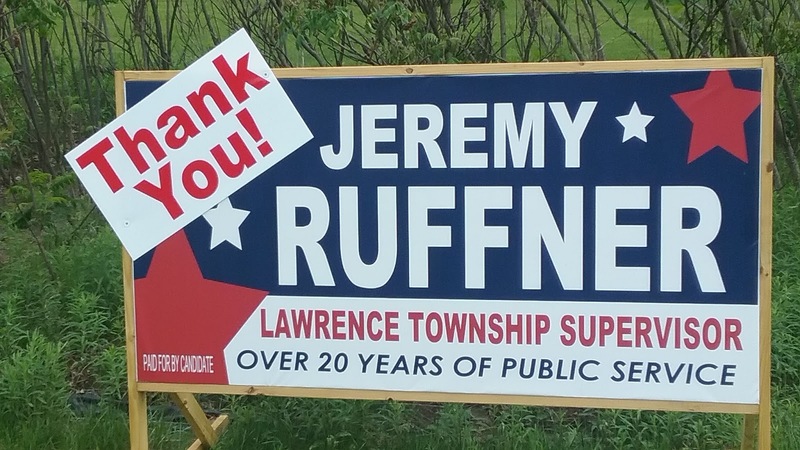 You will hear that according to election office that Mr. Ruffner has not paid for these signs yet. He is paying with credit card and has no idea as to the cost as he has not yet received a bill. Must be a very liberal company to ship such expense signs without payment. ( Business accounts generally have 30 to 90 day invoicing). Unfortunately the audio clip is unavailable at this time. 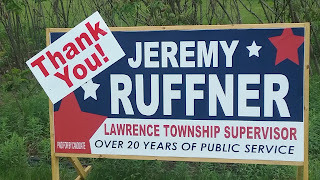 Now here is excerpted text from a letter received by the same election office in July 2017 saying that Mr. Ruffner still does not need to file a finance report as his signs were homemade from materials he had on hand. "HE ALSO STATED THAT HE MADE HIS OWN SIGNS AND HAD A LOT OF THE SUPPLIES ON HAND"
"DURING THAT CONVERSATION I INQUIRED ABOUT THE FILING OF CAMPAIGN FINANCE REPORT AND HE IMFORMED ME THAT HE DID NOT HAVE THE BILLS YET"
Very interesting. How do you not receive a bill yet for the materials you had on hand. 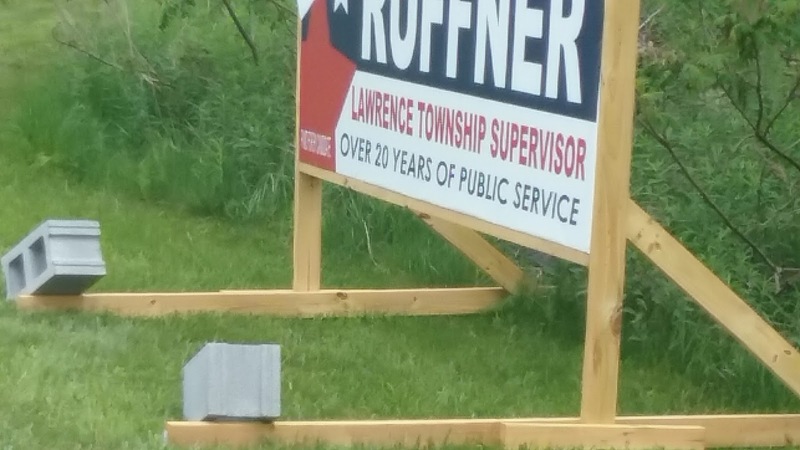 Do you want someone who cannot even tell the truth about a few simple campaign signs holding an elected office such as township supervisor? Now the burden of proof lies with the above named candidate to show proof of his cost for campaign signs and the source of said funding to purchase these signs. Also of note is 5 day limit after an election to remove signs. ALL other candidates removed their signs within this timeframe. 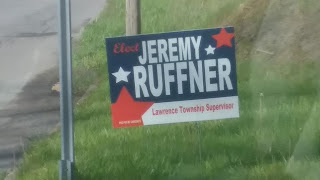 Mr. Ruffner though had his up until after the Memorial Day holiday end of May. Pictures of several smaller signs. Very nicely made signs on cloraplast material that requires specialized printers and ink made from materials one had on hand.